TOKYO --- Mitsubishi Heavy Industries, Ltd. (MHI) has decided to increase the capitalization of Mitsubishi Aircraft Corporation (Mitsubishi Aircraft), a wholly owned MHI Group company, as it nears the first delivery of the Mitsubishi Regional Jet (MRJ), the industry's only clean sheet regional aircraft. The decision by MHI to increase its investment in Mitsubishi Aircraft has two objectives: first, to add 170 billion yen to the company's capital, and second to cancel 50 billion yen of the total debt owed by Mitsubishi Aircraft to MHI. 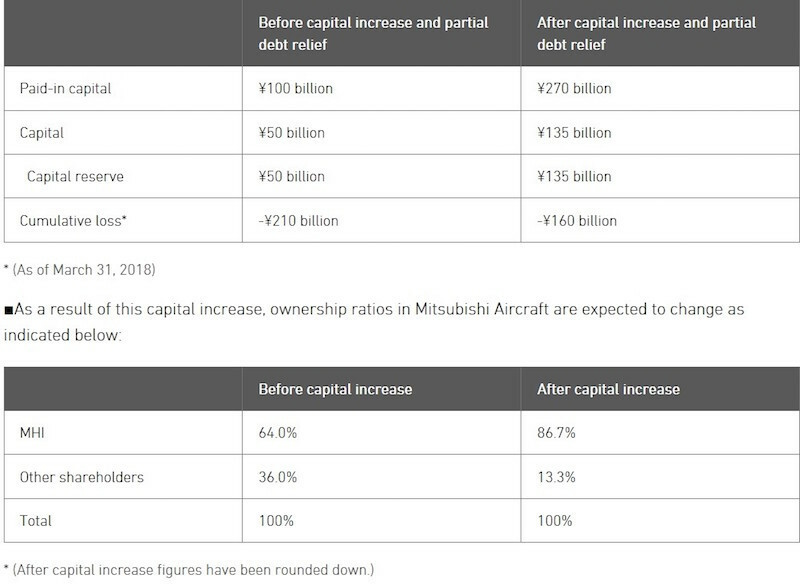 The added capital will bring Mitsubishi Aircraft out of its capital deficit and provide the company with funds to enable continued development of the MRJ. As of March 31, 2018, the company's liabilities exceeded assets by 110 billion yen. With the 170 billion yen to be acquired from MHI, Mitsubishi Aircraft will allocate 85 billion yen to its capital and an equal amount to its capital reserve. Simultaneously, MHI will cancel 50 billion yen of the total debt owed to it by Mitsubishi Aircraft. The infusion of 170 billion yen will increase Mitsubishi Aircraft's paid-in capital from 100 billion yen to 270 billion yen. The capital infusion from MHI will be allocated mainly to development of the MRJ90 and to future expenditures borne by MHI in preparation for commercialization. Business results and the financial status of MHI's Group companies are continuously factored into the Company's consolidated financial statements. The capital increase in Mitsubishi Aircraft indicated here will have no impact on MHI's consolidated results. The changes in capital and capital reserve are indicated above.